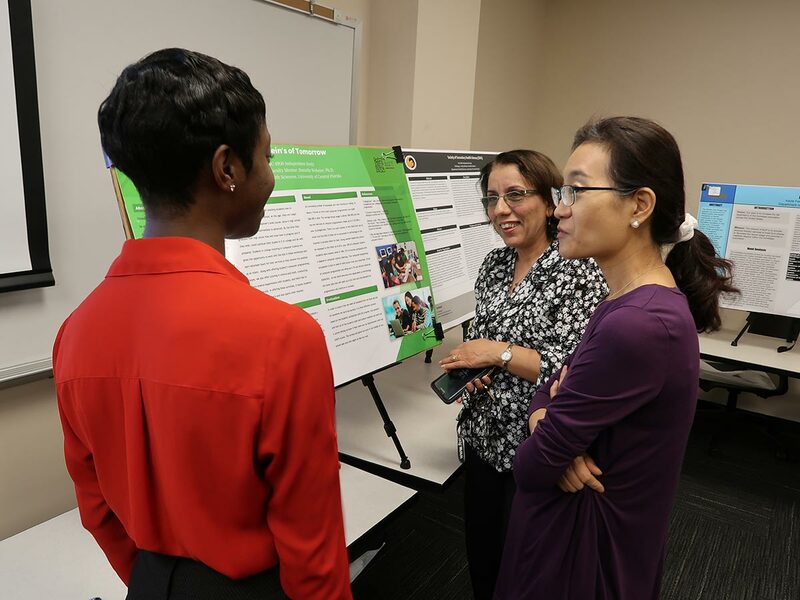 Senior health sciences student Sarai Welch, left, presents her research on STEM education in low-income communities to visiting instructor Katia Ferdowsi, center, and assistant professor Eunkyung "Muriel" Lee, right. The Department of Health Sciences works tirelessly to ensure that its 4,000 undergraduate students are actively engaged in their education at UCF. “We are really emphasizing integrative learning in our program,” said Suha Saleh, program director and interim department chair, adding that avenues such as internships, research and health outreach programs are available to students. In particular, faculty members strongly encourage students to participate in research. It is also a high priority when recruiting new faculty members to the department, said Saleh, who encourages her faculty to cultivate research mentorships with their students. Assistant Professor Michael Rovito says that, over the years, interest in conducting undergraduate research has increased among students as they learn the importance of research and broaden their understanding of how to conduct it. Rovito mentors several students each year on topics such as men’s health and behavioral health. He works both to foster genuine interest in research and impart the skills needed to engage in self-directed projects. During her two years at UCF, Eunkyung “Muriel” Lee, an assistant professor in the department, also has seen a thirst for knowledge and interest in research among students. “I had some students reach out to me before I actually began teaching here,” she said. Senior Chandler Shiley began doing research with Rovito after transferring to UCF. One of his long-term goals is to publish his findings in a professional journal. Shiley has sharpened multiple skills while conducting research on men’s health, sexual health and athletics. These skills include time-management, organization, critical thinking, problem solving, professional networking and the ability to decipher research literature. Shiley plans to apply for the Doctor of Physical Therapy Program at UCF and believes that his experience in research as an undergraduate student will strengthen his application. One of the greatest benefits for Shiley and other students is the ability to cultivate long-term relationships with professors and faculty members that extend beyond the classroom. “Moving away from that student-professor relationship to more of a colleague-to-colleague relationship, you get to know the professor on a more personal level and they get to know you better,” Shiley said. Many of the professor-student relationships formed lead to better preparation for graduate school and the career field, opportunities to present research at conferences and symposiums, and publication in professional articles and journals. Last spring, two groups of students under Lee’s mentorship presented their research at the Showcase of Undergraduate Research Excellence. One student had graduated in December and was working full-time, but came to campus every Wednesday night after work to complete the research she began with her group and Lee the previous semester. Students comment that conducting research provides them a chance to apply classroom knowledge in real-world situations, Lee said. “They told me that what they learned in class comes together for them when doing their research,” she said.